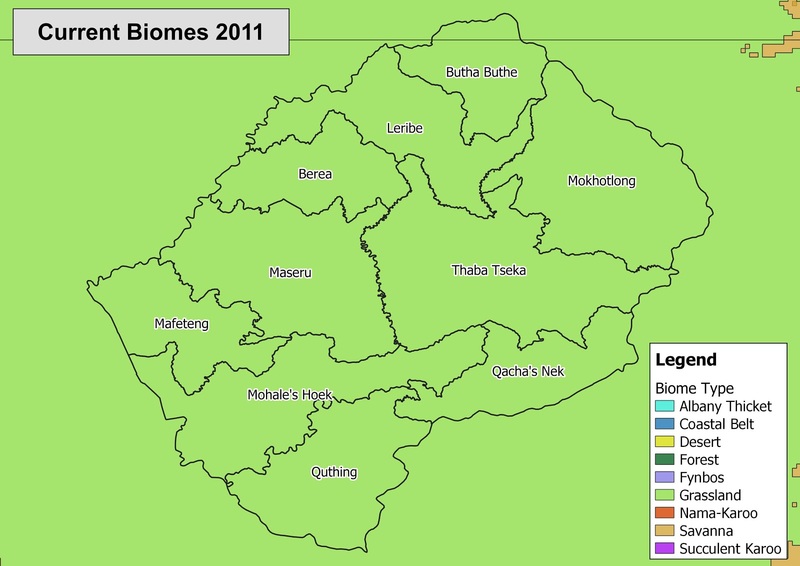 In all four agro-ecological zones, Lesotho is dominated by the Grassland Biome (Figure 2) with less than 1% of Lesotho covered by forests (Gwimbi et al. 2013). The Grassland Biome is characterised by a single layer of grass with varying degrees of land-cover depending on rainfall and grazing practices. It mostly occurs in summer rainfall areas and is one of the least conserved and most threatened biomes in Southern Africa (DEA 2013). The Grassland Biome is essential for agriculture in Southern Africa and has the second highest level of biodiversity after the Fynbos Biome (Mucina and Rutherford 2006). In Lesotho, the condition of grasslands is becoming progressively worse due to poor land-use management, unsustainable land-use practises, recurrent droughts and floods (Gwimbi et al. 2013). The Grassland Biome provides essential ecosystem services such as the regulation of water flow (DEA 2013). This is especially important in Lesotho where the flow of water (and wind, poor land management, etc.) have led to extensive soil erosion, soil loss and land degradation (CIAT and World Bank 2018; Mekbib et al. 2017; Lesotho Meteorological Services 2017; Ministry of Local Government and Chieftainship Affairs 2015; The Kingdom of Lesotho and FAO 2012; Dejene et al. 2011). Highest priority for action: Grassland and Indian Ocean Coastal Belt. High priority for action: Fynbos and Forest. Medium priority for action: Nama Karoo and Succulent Karoo. 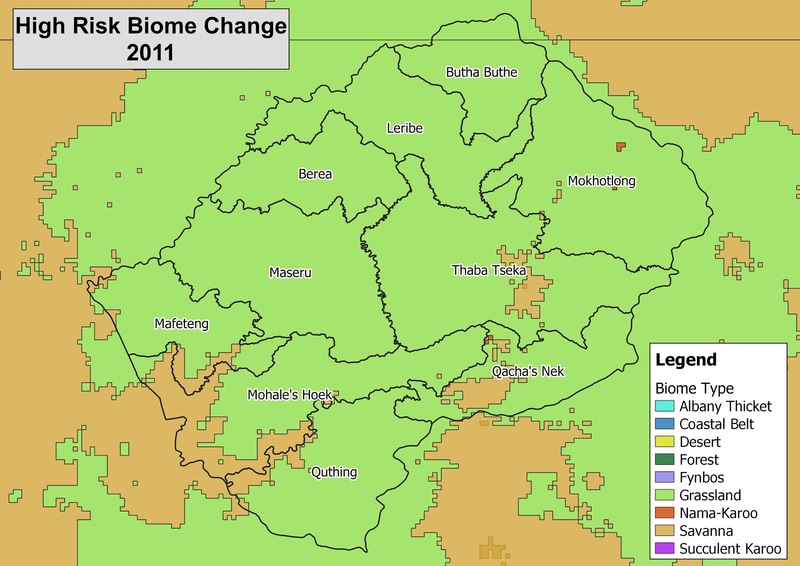 The maps below (Figure 3 and Figure 4) show the shift in biomes in Lesotho given different climate scenarios modelled by the South African National Biodiversity Institute (SANBI) in 2011. Under the medium-risk climate scenario (Figure 3) there is little change to the dominance of the Grassland Biome although the Savanna Biome appears in the south-west of Lesotho (SANParks 2011c). 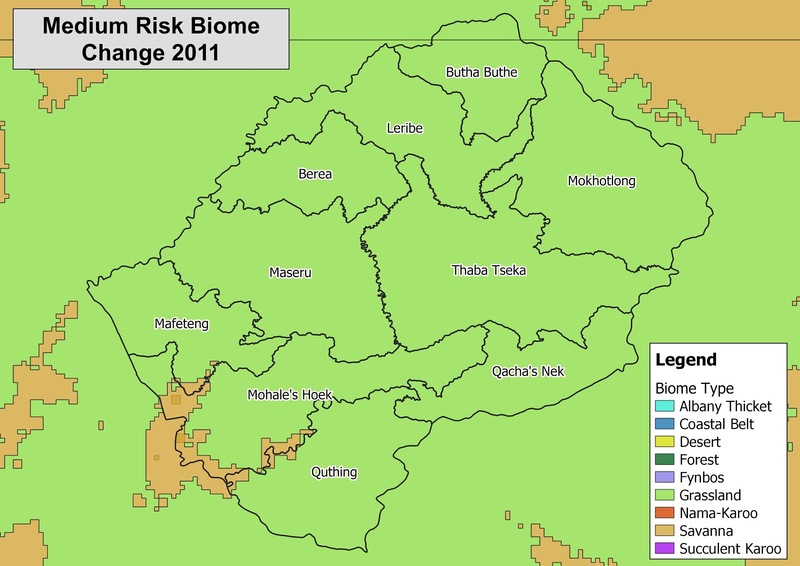 Under the high-risk climate scenario (Figure 4) it is forecast that the Savanna Biome will displace the Grassland Biome in larger parts of south-western Lesotho as well as some south-eastern parts of Lesotho (SANParks 2011b). Establishing an ecosystem-based protected areas system. Increasing public education and awareness of biodiversity issues. Increasing the capacity for nature and biodiversity conservation. 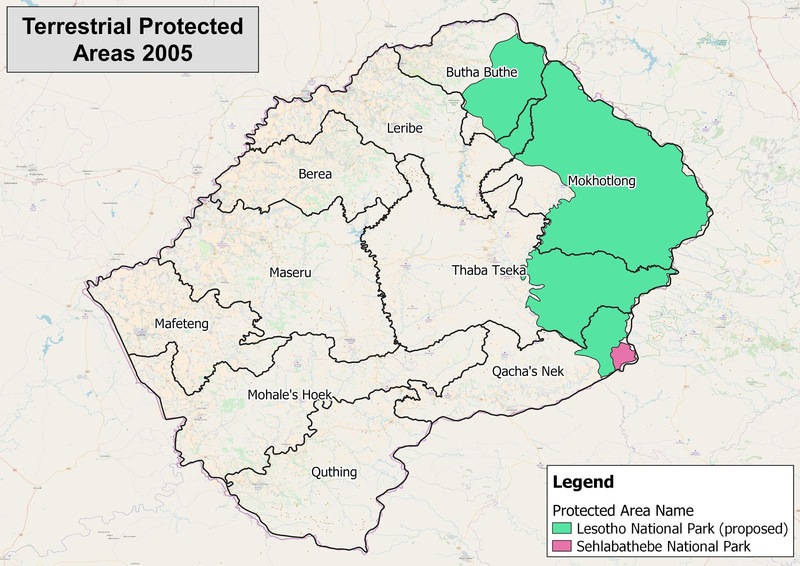 Establishing protected areas in a variety of ecosystem types especially threatened ecosystem types such as wetlands is important for the conservation of Lesotho’s biological diversity and ecosystems (National Environment Secretariat 2000). 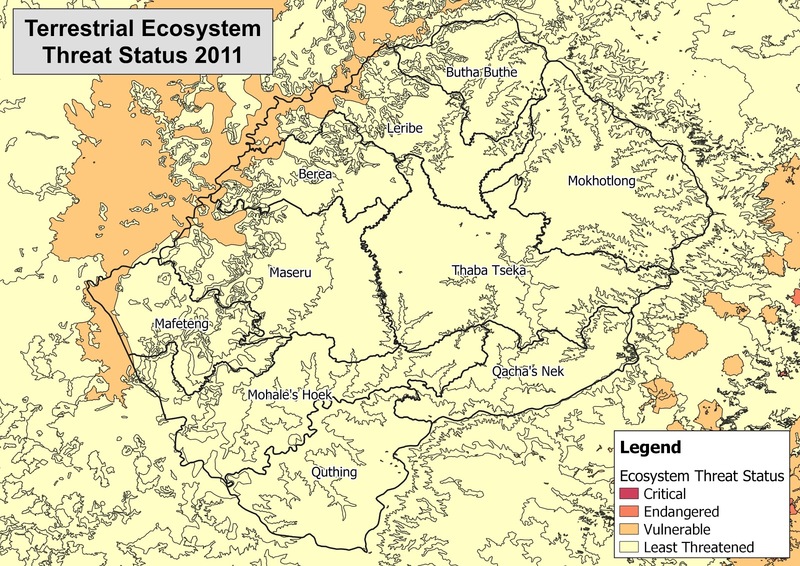 In the north-western and south-western border areas of Lesotho some ecosystems have been classified as ‘Vulnerable’ threat status (Figure 6) (SANBI 2012). However, most of the country is classified as ‘ Least threatened’ (SANBI 2012). Many reports (Gwimbi et al. 2013, 2014; RMSI 2017; Dejene et al. 2011; Mekbib et al. 2017; CIAT and World Bank 2018; Hae 2016) indicate serious biodiversity and ecosystem-related issues in Lesotho, for example, the degradation of mountain ecosystems due to the exploitation of resources and poor land-use management. The classification of most of Lesotho as ‘ Least threatened’ could thus indicate a lack of data about the state of ecosystems in Lesotho. One example of an ecosystem type that is threatened in Lesotho (and many other countries) is wetlands (Trettin et al. 2008; Hoag 2014). Globally, wetlands are one of the most threatened ecosystem types even though they have high biodiversity and the ecosystem services that they provide, such as flood control and water purification, are especially valuable (Hoag 2014; Driver et al. 2012). Wetlands in Lesotho occur mostly in the mountains agro-ecological zone. These wetlands are known as alpine wetlands are made up of seeps and peatlands (Trettin et al. 2008; Hoag 2014). They are rare ecological features in Africa (Trettin et al. 2008; Mokhabuli and Fanana 2012). AB – Natural or good condition. Natural land cover is equal to or more than 75%. C – Moderately modified condition. Natural land cover is greater than 25% but less than 75%. Z1 – Heavily to critically modified condition. Wetland overlaps with waterbody e.g. a dam. Z2 – Heavily to critically modified condition. Majority of the wetland is classified as ‘artificial’. Z3 – Heavily to critically modified condition. Natural land cover is less than 75%. What is known is about Lesotho’s wetlands is that they have been seriously degraded due to overgrazing, overuse and changes in climate (Trettin et al. 2008; Lewis and Oosthuizen 2014; Lesotho Meteorological Services 2017; Mokhabuli and Fanana 2012; Hoag 2014). This degradation has caused soil and gully erosion, compaction of soils (trampled by livestock), losses of carbon storage, increased sedimentation of rivers and dams lower down in catchments, less flood attenuation (healthy wetlands reduce flood impacts) and a loss of biodiversity (Trettin et al. 2008; Lewis and Oosthuizen 2014; Lesotho Meteorological Services 2017; Mokhabuli and Fanana 2012; Hoag 2014). Lesotho is largely rural, and land is predominately used for agricultural purposes. Other land uses include urban areas, conservation areas and forestry areas (plantations). These land uses have had varying effects on the biological diversity and the levels of ecosystem services in Lesotho. According to the Millennium Ecosystem Assessment, ecosystem services are “the benefits that people obtain from ecosystems”, which can be divided into four categories: provisioning (e.g. timber), supporting (e.g. nutrient recycling), regulating (e.g. water purification), cultural (e.g. recreational activities) (Millennium Ecosystem Assessment 2005). Biodiversity and ecosystem services in Lesotho has been positively influenced by the conservation areas. However, they have been negatively influenced by: soil erosion, land degradation (from overstocking, overgrazing, overharvesting, etc. ), invasive alien species, pollution, spatial growth (such as the expansion of urban areas), use of wood and other biomass as an energy source and population growth (CIAT and World Bank 2018; Mekbib et al. 2017; Lesotho Meteorological Services 2017; National Environment Secretariat 2009; UNDP 2017). These existing challenges have reduced ecosystem services (particularly provisioning services and regulating services) in Lesotho and will continue to do so if they are not reduced. If the biodiversity and related ecosystem services in Lesotho are badly reduced, it could have direct negative consequences for the economy and social structures in Lesotho. These consequences could have a detrimental effect on efforts to reduce poverty, food insecurity, inequity and unemployment in Lesotho. Furthermore, it is predicted that climate change will exacerbate these challenges and their effects on biodiversity and ecosystem services in Lesotho (CIAT and World Bank 2018; Mekbib et al. 2017; Dejene et al. 2011; Lesotho Meteorological Services 2017, 2007). 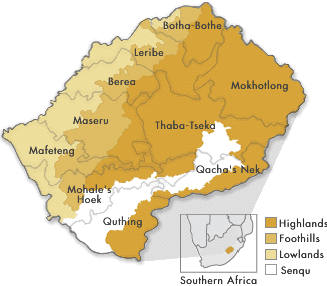 All four agro-ecological zones (Mountains, foothills, lowlands and Senqu River Valley) occur in the Mohale’s Hoek District. The Senqu River valley region is moderately vulnerable to soil erosion, while the other three zones are all highly vulnerable to soil erosion (RMSI 2017). In the Mohale’s Hoek District, soil erosion and Land degradation have been severe, resulting in the formation of numerous dongas (gullies created through soil erosion) (World Vision International 2014). From 2012 to 2014, the Lesotho Government, in collaboration with local participants and an aid/development organisation (World Vision International), ran a project to stabilise the worst of these dongas in the Mohale’s Hoek District (World Vision International 2014). This project led to a reduction in soil erosion and gradual increase in vegetation in the areas where dongas were fixed (World Vision International 2014). Much of Mohale’s Hoek District is made up of semi-arid rangelands, constituting of grasslands and some scrub (RMSI 2017). Climate change is forecasted to increase temperatures and decrease rainfall (notably at peak season) in Mohale’s Hoek District, which is predicted to lead to a decline in grassland productivity of between 40% to 90% (RMSI 2017). Furthermore, under a high-risk scenario (Figure 3), the western parts of Mohale’s Hoek District will shift from the Grassland Biome to the Savannah Biome (SANParks 2011b). CSIR. 2011. “National Freshwater Ecosystem Priority Areas (NFEPA): Wetlands 2011 [Vector Geospatial Dataset].” http://bgis.sanbi.org/SpatialDataset/Detail/395. DEA. 2013. “Long Term Adaptation Scenarios, Phase 1 – Technical Report – No 6 of 6 – Biodiversity Sector In South Africa.” https://drive.google.com/file/d/0B88z-WjOEKIlTm5qc0QyMDhVRjQ/. Driver, A., K.J. Sink, J.N. Nel, S. Holness, L. Van Niekerk, F. Daniels, Z. Jonas, P.A. Majiedt, L. Harris, and K. Maze. 2012. National Biodiversity Assessment 2011: An Assessment of South Africa’s Biodiversity and Ecosystems: Synthesis Report. Pretoria: South African National Biodiversity Institute and Department of Environmental Affairs. http://biodiversityadvisor.sanbi.org/wp-content/uploads/2016/07/NBA-2011-Synthesis-Report-low-resolution.pdf. Hoag, Colin B. 2014. “Alpine Wetlands: Lesotho’s ‘Water Silos.’” Colin B. Hoag (blog). May 25, 2014. https://colinhoag.wordpress.com/2014/05/25/alpine-wetlands-lesothos-water-silos/. Lesotho Bureau of Statistics. 2018. “2016 Environmental Report.” Statistical Report 17. Maseru, Lesotho: Lesotho Bureau of Statistics. http://www.bos.gov.ls/New%20Folder/Environment%20and%20Energy/2016_Environment_Report.zip. Millennium Ecosystem Assessment. 2005. Ecosystems and Human Well-Being: A Framework for Assessment. Washington DC: Island Press. Mokhabuli, Nthabiseng, and Makomoreng Fanana. 2012. “Design of Wetlands Rehabilitation Interventions in Alpine Wetlands of Lesotho.” In Proceedings of the 14th International Peat Congress. Stockholm: International Peatland Society. 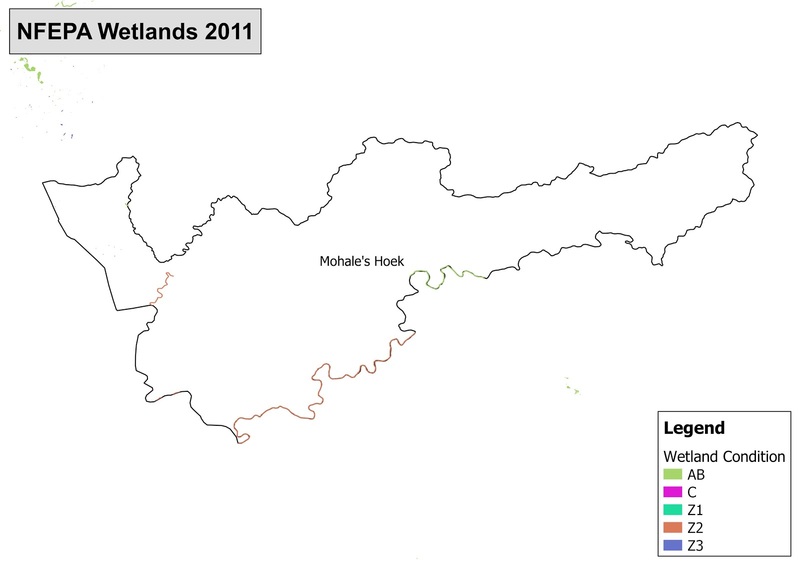 http://www.peatlands.org/document/design-wetlands-rehabilitation-interventions-alpine-wetlands-lesotho. National Environment Secretariat. 1998. “Biological Diversity in Lesotho – Convention on Biological Diversity: First Country Report to the COP.” Maseru, Lesotho: National Environment Secretariat. https://www.cbd.int/doc/world/ls/ls-nr-01-en.pdf. ———. , ed. 2000. National Strategy on Lesotho’s Biological Diversity: Conservation and Sustainable Use. Maseru, Lesotho: National Environment Secretariat. ———. 2009. “Lesotho Fourth National Report on Implementation of Convention on Biological Diversity.” Maseru, Lesotho: National Environment Secretariat. https://www.cbd.int/doc/world/ls/ls-nr-04-en.pdf. RMSI. 2017. “Climate Change Scenario Modelling & Risk Assessment – Mohale’s Hoek, Lesotho: Reducing Vulnerability from Climate Change in Foothills, Lower Lowlands and Senqu River – Final Technical Report.” RMSI: New Delhi, India. SANBI. 2012. “NBA 2011 Terrestrial Ecosystem Threat Status [Vector Geospatial Dataset].” South African National Biodiversity Institute. http://bgis.sanbi.org/SpatialDataset/Detail/411. SANParks. 2005. “Archived NSBA Terrestrial Protected Areas [Vector Geospatial Dataset].” South African National Biodiversity Institute. http://bgis.sanbi.org/SpatialDataset/Detail/150. ———. 2011a. “CCAB – Current Biome Delineations 2011 [Vector Geospatial Dataset].” Available from the Biodiversity GIS website. http://bgis.sanbi.org/SpatialDataset/Detail/484. ———. 2011b. “CCAB – High Risk Scenarios – Biome Delineations 2011 [Vector Geospatial Dataset].” Available from the Biodiversity GIS website. http://bgis.sanbi.org/SpatialDataset/Detail/486. ———. 2011c. “CCAB – Medium Risk – Climate Scenarios – Biome Delineations 2011 [Vector Geospatial Dataset].” Available from the Biodiversity GIS website. http://bgis.sanbi.org/SpatialDataset/Detail/475. Trettin, Carl C., Loren Labovitch, Sekhonyana Lerotholi, and Evan Mercer. 2008. “The Peatlands of Lesotho – an Important Ecological and Socio-Economic Resource.” After Wise Use – The Future of Peatlands 1: 88–91. UNDP. 2017. “Lesotho Country Analysis Working Document Final Draft.” http://www.undp.org/content/dam/unct/lesotho/docs/Key%20Strategic%20Documents/Lesotho%20CCA_Final%20Draft_22%20September%202017_rev.pdf. World Vision International. 2014. “Telling Our Stories: Leveraging Food Assistance for a Hunger-Free World.” https://www.worldvision.org/wp-content/uploads/telling-our-stories-report.pdf.